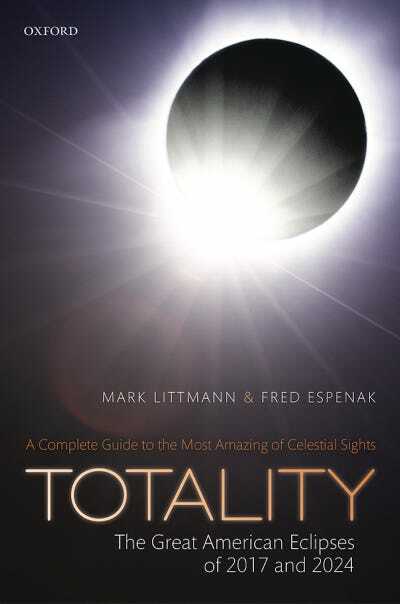 Mark Littmann, Fred Espenak, "Totality"
In 1695, Edmond Halley discovered that eclipses recorded in ancient history did not match calculations for the times or places of those eclipses. Starting with records of eclipses in his day and the observed motion of the moon and sun, he used Isaac Newton’s new theory of universal gravitation (1687) to calculate when and where ancient eclipses should have occurred and then compared them with eclipses actually observed more than 2,000 years earlier. They did not match. Halley had great confidence in the theory of gravitation and resisted the temptation to conclude that the force of gravity was changing as time passed. Instead, he proposed that the length of a day on Earth must be slowly increasing. The Earth’s rotation must be slowing down. Copyright 2017 by Mark Littmann and Fred Espenak/Oxford University PressThis excerpt is from the book ‘Totality: The Great American Eclipses of 2017 and 2024’, by Mark Littmann and Fred Espenak. If the Earth’s rotation had slowed down slightly, the moon must have gained angular momentum to conserve the total angular momentum of the Earth-moon system. This boost in angular momentum for the moon would have caused it to spiral slowly outward from the Earth to a more distant orbit where it travels more slowly. If, 2,000 years earlier, the Earth had been spinning a little faster and the moon had been a little closer and orbiting a little faster, then eclipse theory and observation would match. Scientists soon realised that Halley was right. But what would cause the Earth’s spin to slow? The gravitational attraction of the moon is the principal cause of the ocean tides on Earth. As the shallow continental shelves (primarily in the Bering Sea) collide with high tides, the Earth’s rotation is retarded. The slower spin of the Earth causes the moon to edge farther from our planet. From 1969 to 1972, the Apollo astronauts left a series of laser reflectors on the moon’s surface. Since then, scientists on Earth have been bouncing powerful lasers off these reflectors. By timing the round trip of each laser pulse, the moon’s distance can be measured to an accuracy of several inches. The moon is receding from the Earth at the rate of about 1.5 inches (3.8 centimeters) a year. As the moon recedes from Earth, its apparent disk becomes smaller. Total eclipses become rarer; annular eclipses more frequent. Total eclipses are moving toward extinction. When the moon’s mean distance from the Earth has increased by 14,550 miles (23,410 kilometers), the moon’s apparent disk will be too small to cover the entire sun, even when the moon’s elliptical orbit carries it closest to Earth. Total eclipses will no longer be possible. How long will that take? With the moon receding at 1.5 inches a year, the last total solar eclipse visible from the surface of the Earth will take place 620 million years from now. There is still time to catch one of these majestic events. Excerpted from Totality: The Great American Eclipses of 2017 and 2024 by Mark Littmann & Fred Espenak. Copyright © 2017 by Mark Littmann and Fred Espenak and published by Oxford University Press. All rights reserved.